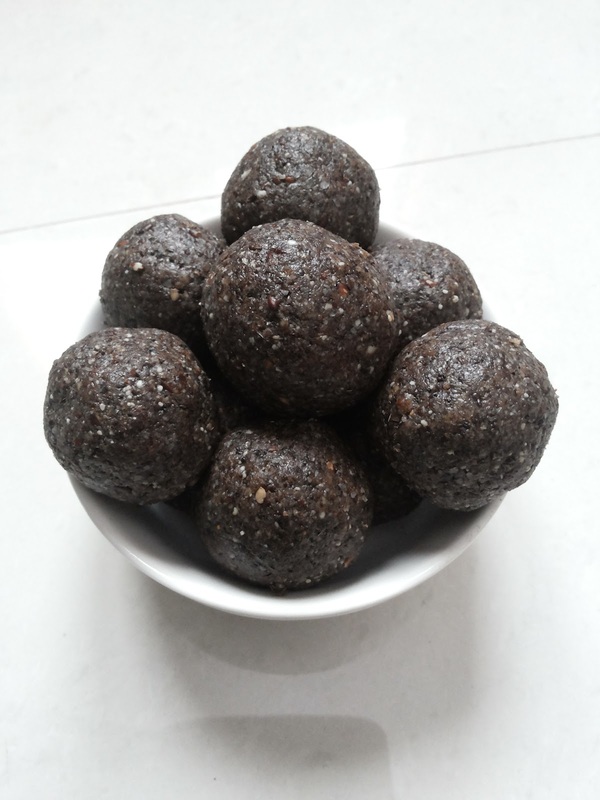 Eat Pray and Cook: Sesame Seeds Balls - Keep it Simple, Keep it Healthy. 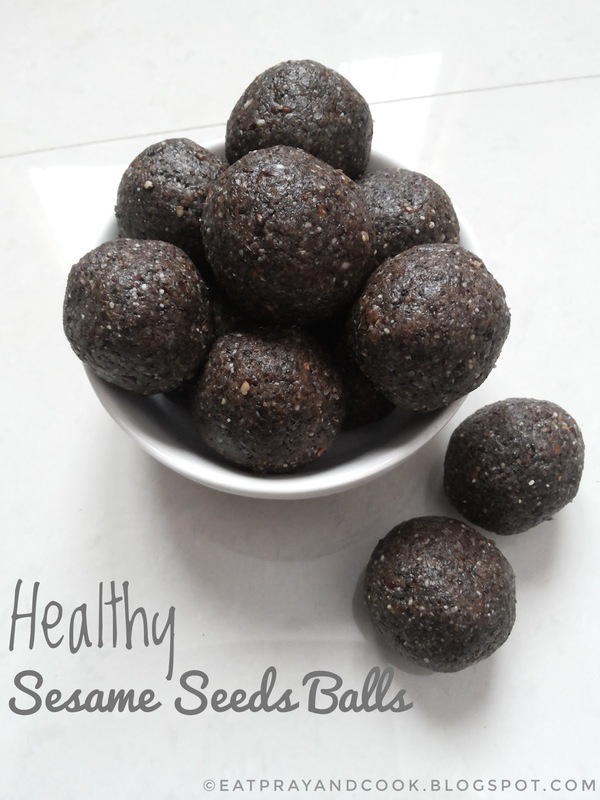 Sesame Seeds Balls - Keep it Simple, Keep it Healthy. Sesame seeds jaggery balls is a sweet laddu which is easy to make and good to eat. I remember my grandmother making it.. pounding the roasted sesame seeds manually with jaggery. But now.. all the hard work is saved. Use a mixer or blender. But taste - I can say we have compromised. The taste and flavour we get by manually pounding the sesame seeds and jaggery is incomparable. But now we cannot think about traditional manual gadgets. We have lost them! But, something is better than nothing. Use a mixer. That is all 😁. This is some what similar to that filling which we make for some pooranam kozhukattais during festivals like Varalakshmi Nombu or for Vinayagar Chathurthi. Kids will definitely like this sweet and healthy snack. Now.. you have to get a good quality sesame seeds. You need the black ones and not the white sesame seeds. The black ones have more nutty and intense flavour which gives the laddus a country touch. Make sure you get a good jaggery that doesn't have any sand or dust in it as we are going to just grind it along with sesame seeds. Wash and dry the sesame seeds in hot sun till it is nice and crisp dry. Now roast them in medium heat. After some time nice aroma emanates from it. Later you will be able to hear the seeds starting to pop up. Now roast further for exact 5 minutes. Take care you do not over roast it so that the flavour is lost. Remove from heat. Transfer this to a dry plate and let it come to room temperature. Crumble the jaggery in a old news paper or grate them in a grater. Take a blender and transfer the sesame seeds into it first and run the blender. Use ONLY the whipper to run the mixer. Because if you run faster than this, the oil from the seeds makes it more sticky. Let the seeds first grind coarsely. Then add the jaggery and run the blender again. Remember to use the whipper only. The mixture is now evenly mixed. Transfer this a plate. The sweet, flavourful, healthy and easy to make sesame seed jaggery balls are ready to be stored on shelf and consumed for the next 2 weeks. Too much of anything is bad for health. This is also a one such healthy snack which is not advisable for adults to consume more than a laddu a day. It causes more heat in body. But small children can have little more than adults. If women consume more, the menses cycle will be earlier that month. Consuming in moderate amount is really healthy for bones. Super recipe, Will try for my toddler and will let you know how it has come.. Thanks Surekha.. Yes, will be very much happy to hear from you !